These yummy cupcakes are a lemon lovers delight! 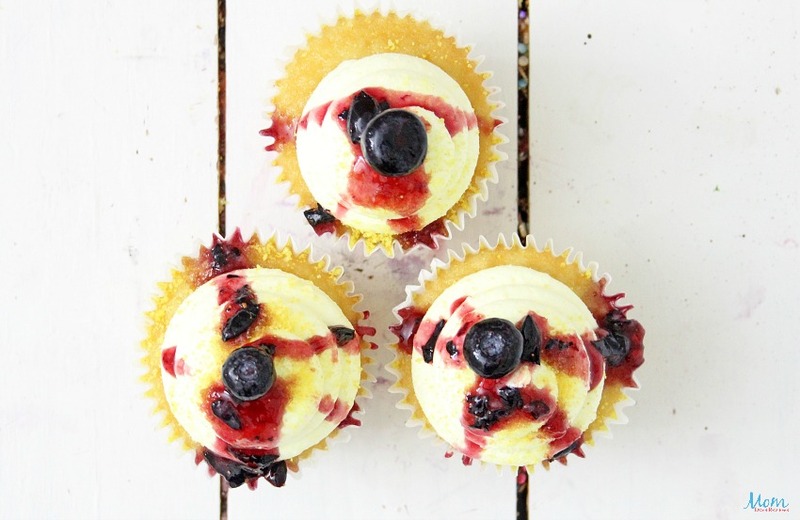 They have a soft and light texture with the addition of tart blueberries and topped with sweet cream cheese frosting. 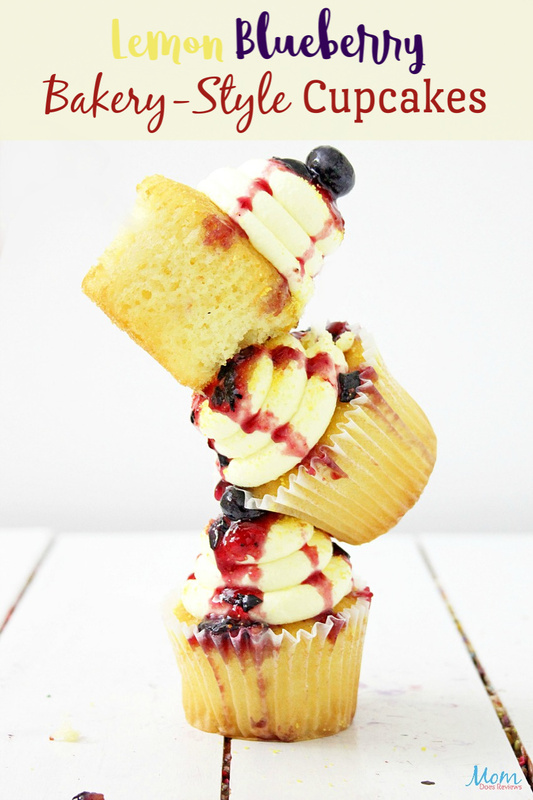 The flavor combination in these Lemon Blueberry Bakery-Style Cupcakes with Lemon Cream Cheese Frosting is to die for! You just can’t help but love these delicious and flavorful cupcakes! If you love scrumptious lemon cupcakes be sure and check out these scrumptious Lemon Glaze Cupcakes! In the mixing bowl of a stand mixer, using the whisk attachment, cream the butter, sugar, eggs, vanilla, milk, lemon juice and lemon zest. In a separate bowl mix the cake flour, baking powder and salt, and add to the mixing bowl a little at a time, mixing on low until all of the flour mixture is well blended. Scrape the sides of the bowl and mix again. In another bowl, mix the powdered sugar and flour until well blended, and mix in with the blueberries, to coat berries, then gently fold berries into the cupcake batter. Place cupcake liners in two 12 count muffin tins, and fill the liners about 2/3 full with the batter. Turn on the oven and bake at 350 for about 20 minutes, or until a toothpick inserted in the center comes out clean. Remove the cupcakes from the oven, and place cupcakes on a wire rack to cool. When cupcakes have cooled, take out the center of the cupcakes, with a cupcake corer, and place the removed piece of cupcake beside the cupcake. 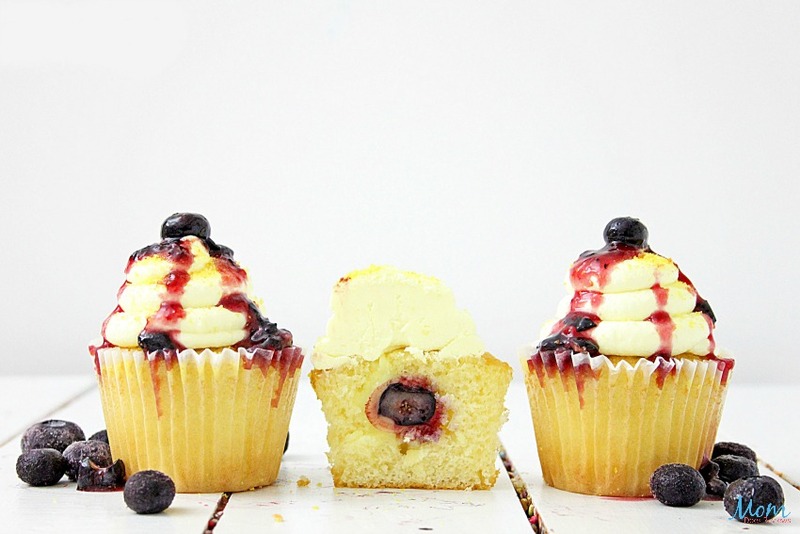 Place a blueberry in the center, and a teaspoon of lemon curd on top of the blueberry. 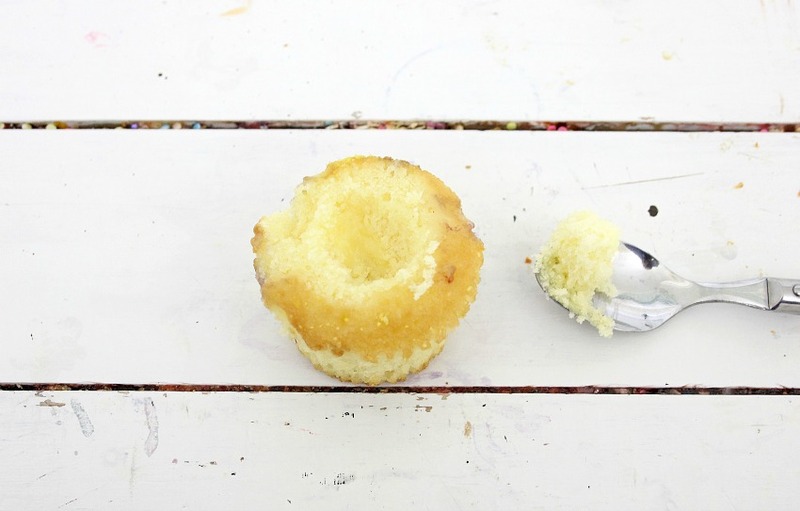 Place the piece of cupcake that you removed with the corer back in the cupcake, and press down slightly. With the frosting in the pastry bag, swirl frosting on top of the cupcakes, top with a whole blueberry, and blueberries mashed with sugar, if desired. Place cupcakes in a single layer container, and place in the refrigerator for at least two hours, to chill the cupcakes, or overnight for best results. In the stand mixer, with the whisk attachment, cream the cream cheese, butter, lemon juice and vanilla until light and fluffy. Add the lemon zest and blend until smooth. 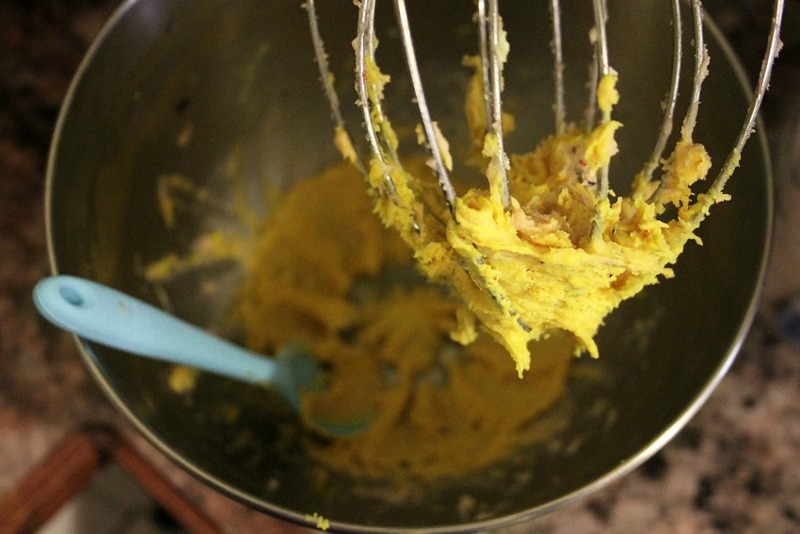 Scrape the sides of the bowl, and mix the frosting with a spoon or spatula. Place the frosting in the bowl into the refrigerator, and let chill while cupcakes cool. Place a few whole blueberries in a bowl, and sprinkle sugar on top of them, and with a potato masher, smash the blueberries and sugar until mashed together. You can spoon a little bit of this over the cupcakes right before serving. Keep cupcakes in the refrigerator for 3 – 4 days in a covered container. Cupcakes can be frozen for up to 30 days. Make sure to store them in a freezer bag, or airtight container. To serve, thaw overnight in the refrigerator, and frost before serving. Place cupcake liners in two 12 count muffin tins, and fill the liners about ⅔ full with the batter. Keep cupcakes in the refrigerator for 3 - 4 days in a covered container. Cupcakes can be frozen for up to 30 days. Make sure to store them in a freezer bag, or airtight container. To serve, thaw overnight in the refrigerator, and frost before serving.